An e-mail was sent earlier and she has already responded! Battle Machines RC Laser Combat Tag cars are the ultimate in remote control awesome fun. No matter if you have boys or girls or even big boys, the Battle Machines are a fun gift for the holiday. We received the complimentary pack that included the Silverado versus Mustang and it lives up to the hype you see in commercials if you have seen them. 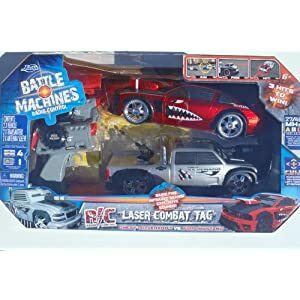 This is not just an ordinary remote control set up but a laser tag version that allows the users to have much more fun trying to chase each other down to shoot their laser at the rear of the other vehicle to disable it and win. The first and second hits halts the opponent vehicle and it will rumble with loud sounds. The next hit disables it thus making one of the players a winner. Both vehicles are made to match their full size counter part and look great down to each detail. They are easy to use and run on standard batteries. They are little powerhouses and can run on many different surfaces. What I also liked was the fact that it made the kids get up and move since they were wanting to win. Have more than two kids? The vehicles can battle against one another up to six vehicles total. 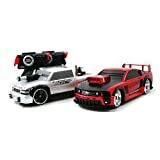 Each twin pack comes with the following: 2 full function Licensed, high performance radio control vehicles 1:16 Scale. Two varieties. (a) ‘69 Camaro vs. ‘06 Mustang (b) ‘99 Silverado Dooley vs. ‘06 Mustang, Laser Canon/Sensors, Digital Voice Warnings, Explosive Sound Effects, Rumbling Motions, Power Meter which displays how many hits the car has taken, and 27/49 Tri Band Technology. My only cons were they require eight batteries and they run out quickly so having rechargeable ones are the way to go. The second con is slip cover to protect the antennae comes off easy which having one that stayed on would be nice but definitely not a deal breaker. Overall, this is a great gift for any kid or adult that likes cars/trucks. They were fast moving, mobile over many surfaces and just created so much fun for the kids. One lucky winner will receive the same set as I did! Enter any of my other giveaways (five entries). Giveaway ends 12/18 at midnight (EST) - US only please. Jada offers many gift ideas and more can be viewed here. I follow you on GFC user id Aline. My daughter really wants a remote controlled car for XMAS for some crazy reason! I follow you through google friend connect. Thanks for the giveaway! Follow. My boys would like a remote control car! I follow you on GFC. My grandson would go crazy if he got this! I've entered your Peaceable Kingdom Fish Stix Giveaway.#5 Thanks!! Following Jada on Twitter as lifewithruthie. I follow you on GFC(Linda G) and the boys would have loads of fun playing with these cars! We just saw these at the store today and my grandson wanted them so bad. I told him maybe Santa will bring them. I'd love to win for him. great web site! thanks for the cotest.. hope to win! I do follower your blog on GFC and thanks for the chance to win such a cool prize. I follow on GFC.My kids and hubby would love to play with these.Tahnks! GFC follower! i would LOVE to win this for my kids!